Mangrove forests are among the most carbon-dense ecosystems in the world and valuable sinks for carbon emissions released into the atmosphere. 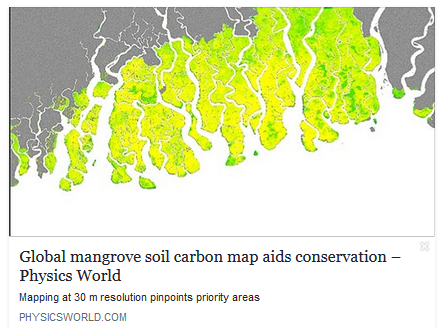 Now a global map of soil carbon in mangrove forests at 30 m spatial resolution could support new ecosystem services policy tools for rewarding the preservation of major environmental assets. “We felt that working at 30 m resolution was critical because of the strong gradients that occur in mangrove forests across the tidal range,” says Jonathan Sanderman of Woods Hole Research Center in the US. Within a few hundred metres, there can often be a two-fold variation in soil carbon stocks and we wanted to be able to capture this important local variance in soil carbon. Sanderman and colleagues developed a machine-learning based data-driven statistical model of the distribution of carbon density at key sites around the world. The tool integrates measurements of mangrove forests from hundreds of studies. The researchers hope it will play a major role in prioritizing conservation efforts and providing a baseline for carbon markets.